After walking through Hogsmeade, you arrive at the gates of Hogwarts castle. The castle towers over the area from its perch on top of a rocky hill. The gates, however, are not “towering” as Universal claims but are rather small in scale, maybe 10 feet to the base of the large, impressive winged boars. To the right of the gate is a set of mock seats for the ride which is deep in the castle. The ride is not capable of holding larger passengers and anyone over 250 pounds is supposed to test out the seats before they commit to taking the ride. You are doing this testing in full view of the streams of people heading into the castle. It is more than a bit embarrassing but aside from this ritual of public humiliation, who could possibly design a ride that does not hold passengers larger than that. As we get closer to the ride itself, we will see that the goal is not necessarily to provide the best experience for the customer but to prove to the other themes parks, especially to Disney, that Universal beat them all by designing what is supposed to be the best, most awesome ride in the world. It is not that at all. The crowd streams into a small doorway carved on the rocky hill. It doesn’t seem very much like Hogwarts, especially when you enter a very dark, tiny vestibule. You expect to see the Entrance Hall and then the Great Hall, all majestic and candle lit with that crazy, alive ceiling. 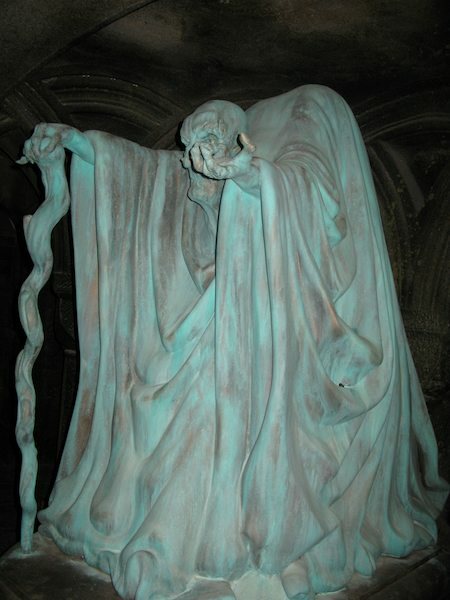 Alas, (as Dumbledore would say) you never enter any great hall or recognizable entrance. 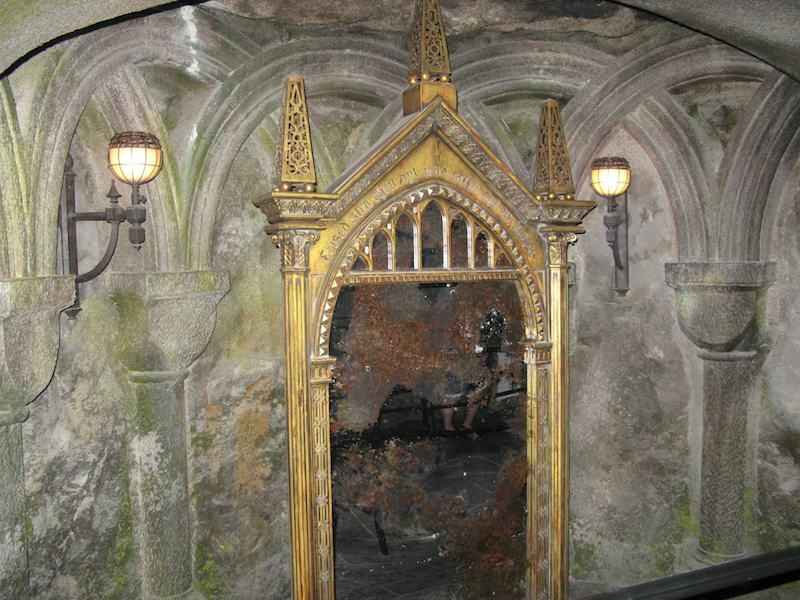 This may seem like a small issue but entrances (as we saw with the unenchanting entrance to Hogsmeade) are crucial for setting the stage for an otherworldly experience. The entry to such an alternative universe should be a portal to what J.R.R. Tolkien (“On Fairy-Stories”) and many folklorists have called the “Faerie,” that dangerous realm of “magic,” “marvels,” and “imagined wonder” that addresses basic (he calls them “primal”) human needs and desires. Among these desires are places that help us think about time and space, encounters that enable us to “hold communion with other living things,” language that reminds us of the power of words, and activities that encourages a co-creation of an experience. The Wizarding World of Harry Potter, starting with its main entry and continuing with this one into the castle, fails at all these tasks. After you enter the castle (and try to adjust your eyes to the very dark lighting) you are directed to the right to the tiny space that holds lockers where you are required to store your belonging because they won’t fit on the ride. This is a common practice on other Universal rides as well and is very annoying. Other theme parks seemed to have worked out letting people keep their possession but Universal has not. I have a particular dislike of this feature because we put bags of purchases in these same lockers one night and someone was able to access our locker and steal most of what we had in it. The lockers in the castle are usually filled up so you have to wait until someone empties theirs. There is a charge if you leave your belongings in for too long. If you don’t intend to ride the ride but just walk through, you can bypass the lockers but the instructions from the staff (who are sometimes but not always located at this entrance) were so muddled it was unclear that one could do this. Anyway, on to the walkthrough which eventually gets you to the ride. The first part of the line goes through a very dark corridor which has a few props just sitting on the side. The Mirror of Erised is here but you do not pass very close to it if the line is moving straight through. You do pass the one-eyed Witch (guarding the passage to Honeydukes) but it was hard to tell what it was because it was so dim. Is it asking too much to supply a few cheap spotlights? Besides, the witch was just opposite the Mirror of Erised, totally out of context for both of them. The line then goes outside of the building and snakes around, sometimes under a canopy with a few fans, sometimes in the sun. I have no objections to standing in a long line to get to a new ride if the line is designed to keep you comfortable and occupied with fun and interesting displays. This one could have used a few more fans and maybe misters to keep the crowd cool. Keeping you interested was another story. The outdoor line then enters what appears to be a large greenhouse with snaking lines up a hill. There are live and fake hanging plants but nothing that looks magical. 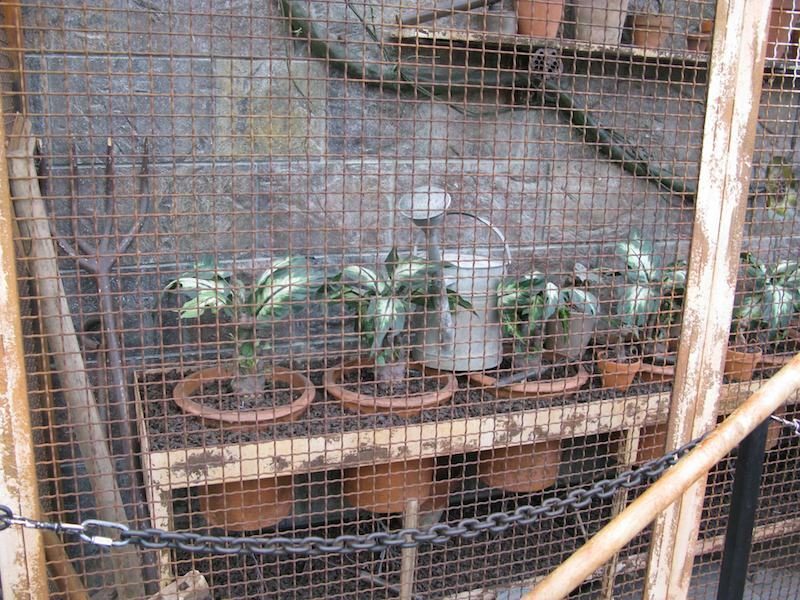 I assume this is Sprout’s greenhouse because later, when you get to the top of the hill, the line passes a narrow set of cages with plants (mandrakes), pots, and a few tools. The cages don’t make any sense and the contents are hard to photograph. When I was dressed as Professor Sprout for Night of a Thousand Wizards, I was asked to pose in front of this case by several people. There are, it reminded me, few costumed characters in the entire Wizarding World (Ollivander, the dancing veelas, shop clerks) and that is a big mistake. Those of us who came in costume for our NoaTW event had to abide by strict rules not to pretend we were part of Universal. Maybe they were afraid we would show them up, show how lively it could be if you just put a few people in costumes and had them interact with the crowd. It wouldn’t take much and this is what is necessary to bring the place alive. As it now exists, it is a passive experience and that is continued as you re-enter the castle proper for the continued walk to the Forbidden Journey. When you re-enter the castle, people applaud because you have made it through this long part of the line. 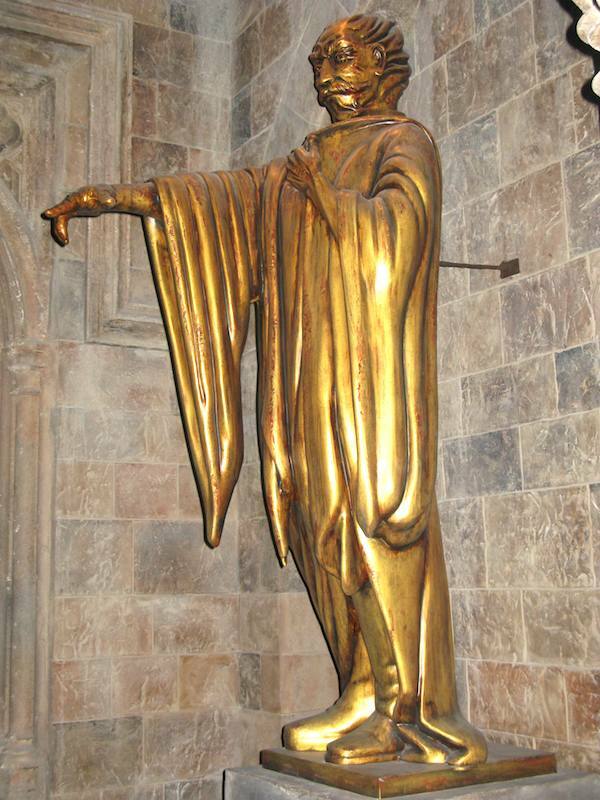 You enter another dark hallway with a statue on the right of what I think is a representation of the founding of Hogwarts. Then there are the house point hourglasses set against the wall (with what looks like sand instead of gems) and a statue of a man pointing that is not identified. Straight ahead is the large phoenix and spiral staircase leading to the headmaster’s office. That is a leap from the entrance hall (hourglasses) to the 2nd or the 7th floor (where the office is supposed to be) and it does not have the gargoyle guarding the entrance. Very confusing. Behind the staircase is a famous wall hanging of a unicorn (seen in the movies in the Gryffindor Common Room) and then on to a tall room with portraits all the way to the top. The room is very dark and the portraits hard to see but some of them are moving and talking. It is hard to step aside and stay in the room so you can hear and see the living portraits but people were trying to do that. 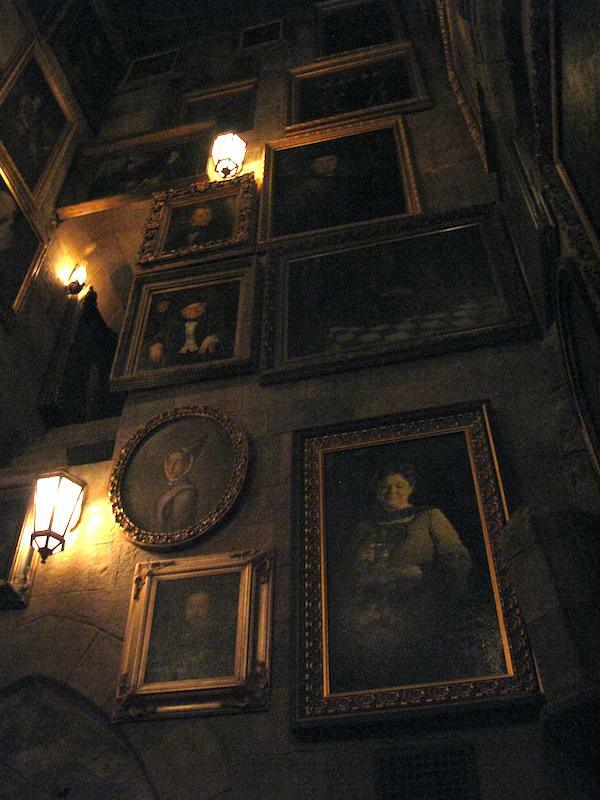 It includes portraits of the founders of Hogwarts. Next is an introduction to the narrative that is supposed to make the actual ride have some connection to the Harry Potter story. 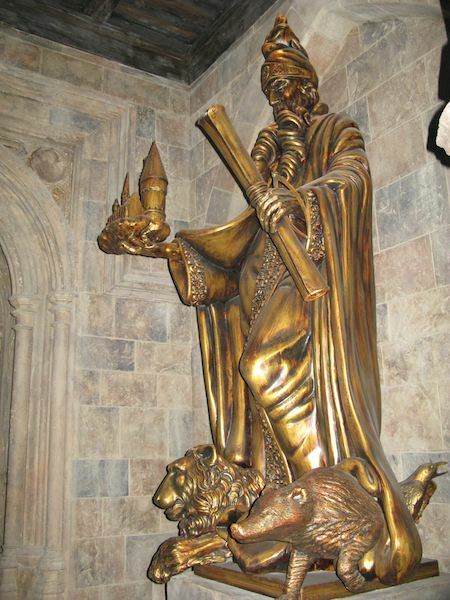 When you enter Dumbledore’s office (again, so dark you can’t see the objects displayed in the cases on the wall) you are greeted by a video projection of Dumbleore up on a balcony. It is nicely done but hard to hear because the crowd chatters loudly and most people don’t stop to listen. There are several versions of this lecture and all talk about wizarding values. Dumbledore tells you to enter the Defense Against the Dark Arts Classroom not for a DADA lesson but for a History of Magic lecture by Professor Binns. Huh? 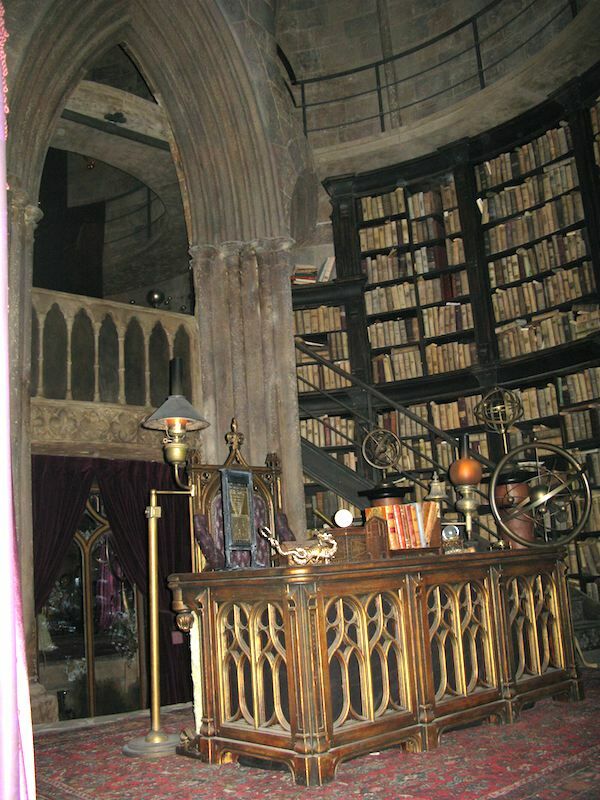 Then you enter the DADA classroom (dim lighting again) where on another balcony, Harry, Ron, and Hermione admit that Professor Binns is both boring and dead so why don’t we join them for a game of Quidditch. Huh? Narrative continuity is not a strong point of this place but this is bordering on the absurd. You are instructed to go the Room of Requirement (and suddenly Ron makes it snow. Huh?) in order to sneak out of the castle. At this point, it became clear that they should have forgotten the millions of dollars they spent filming the movie actors to create this walkthrough. It makes no sense at all. Further along the way there is also a Gryffindor Common Room (furniture against one wall) and a portrait of the Fat Lady that is one of the better effects but she is not at the entrance to the common room. Right before the ride is a Sorting Hat that talks. I never knew which space was the Room of Requirement but I assume it is the one where the ride loads. The ride looks high-tech, not like a magical activity. You get loaded in and a large arm comes over your head and locks you in by pressing down on your legs. The ride twists and turns you as you first view a video of Harry in his quidditch outfit flying around the quidditch stadium. You then encounter a dragon which comes out at you like something from an old funhouse ride, spewing steam and popping its head in and out. This cost millions of dollars? There is also a scene of spiders hanging down and dementors flying at you that are no better than most Halloween decorations in any American neighborhood on October 31st. Not only did this ride attempt to mix up several narrative threads but it looked cheap and cheesy. The ride itself seems to twist, dip, and turn just because it can and many people experience motion sickness on it. The problem is that if you are trying to appeal to many people, why design a ride that makes people sick? Several times I heard people express dissatisfaction with the ride and suggesting that it all could have been done more effectively and simply by having a quidditch version of the California Adventure (Disneyland) favorite called “Soaring over California.” This is simply a video projected on a screen with the audience hanging in seats that move and soar with the action. There is no need to turn people upside down or have junky props jump out. Soaring over California is a ride that people actually applaud in appreciation when it is over. So why didn’t Universal save all that money and do something like Soaring over California? The answer, I think, in in a competitive mindset at the theme park where they were trying to “outDisney Disney” (as we were shown in a marketing presentation at NoaTW). Universal Studios, in addition to getting the rights to Harry Potter over Disney (more on that in a later blog) also got exclusive rights to a ride technology that involves a robotic arm. In this case it seems that the technology drove the ride design, not a narrative or good story like you find in most Disney productions. Universal did not outDisney-Disney, they simply made a state of the art ride that is a mess and that does not provide a wonderful immersive experience. What a shame, what a lost opportunity. Although Soarin’ is a great ride, I would have to say it pails in comparison to HPATFJ. True, the ride isn’t for everyone but like most of Universal’s attractions the rides emphasize on thrills more than anything. It works well with the world of Harry Potter as I have always found the books and films thrilling. Every negative review or I have read or heard so far has always brought up Disney and how they could have done so much more with the world. Lest we not forget that plans with Disney to build a Harry Potter park fell through on the account of the company not J.K. Rowling. Luckily Universal picked up the ball they had dropped and fans of the Potter series now have a park that they can call their own. I doubt highly that Universal’s agendas top priority is “outdo Disney”. Also, the robotic arm technology you speak of that Universal has apparently claimed the rights to, was used first by Disney for Epcot’s Sum of All Thrills. I am fan of both parks, have been since I was young and look at theme parks in general as fun getaway spots. 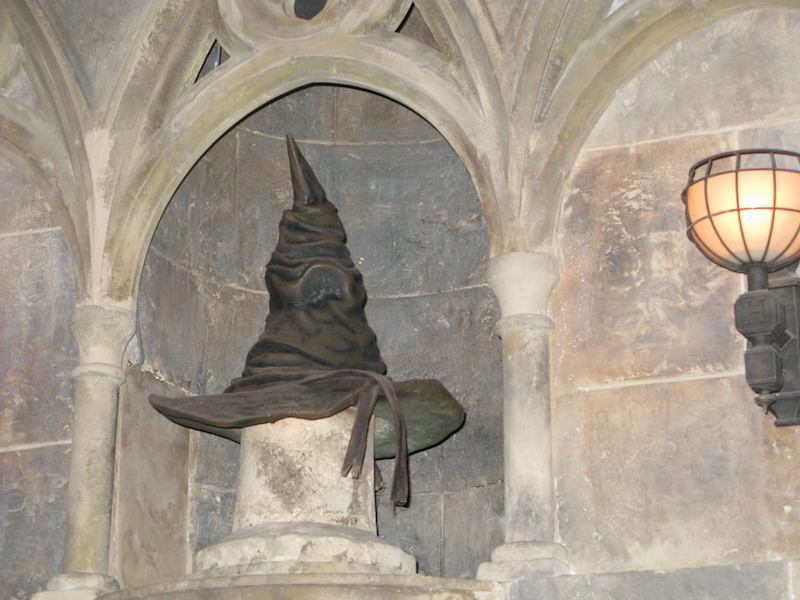 While in the Wizarding World, my too high expectations were blown away. Just a note: I am not comparing Universal to Disney. They did that themselves in a presentation they did for us at the Night of a Thousand Wizards. Their VP for marketing showed us all the positive press they got and a lot of it talked about how they “outDisneyed Disney.” I thought this was an odd thing to be proud of and also not quite true for many reasons (for one thing, Disney is known for it’s polite service and staff at Universal can be surly and rude). The robot arm they got exclusive use of is a new version of that ride contraption (see this article). Also, I do not think of amusement parks as escapens from the real world but as a way to engage with some of our most important ideas, fantasies, and concerns (yes, concerns). First of all, I enjoyed reading this series of articles very much! You made many wonderful points. I agree with you especially on a few, namely the size issue. 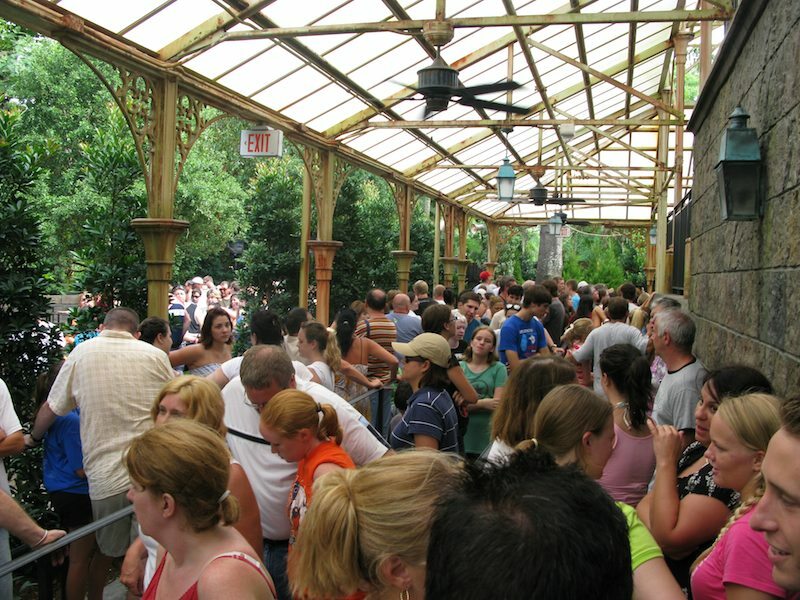 The Hogsmeade area of the land is narrow and congested, and the shops are indeed ridiculously tiny. Not only do you face the choice of waiting in line to enter the shop, but once inside you can hardly move. There’s just something especially infuriating about having to wait in line for the privilege of spending money. I think Universal would have been better off bulldozing the adjacent (and forgettable) ‘Lost Continent’ area in order to make the Harry Potter area more spacious/realistic, especially considering there was no way it wouldn’t pay off. I believe they are considering an expansion now – I took a satisfaction survey that asked me repeatedly if there was anything I would like more than a HP expansion and whether I would come back to see it. I also agree that jaded employees and a lack of costumed characters was an issue. Part of the Harry Potter fandom is attachment to the characters and personalities, not just the setting. A few people addressed the crowd as Muggles, but that was about as in character as anyone got when I visited (save the nice conductor – whom I admit was out of place). As for the ride … I agree … there were problems. As a bigger person, I was paranoid I would not be able to fit on the ride. I was so worried I wore a body shaper underneath my clothes in the heat and avoided eating before riding. I was too embarrassed to try the seats in front of everyone, but thankfully got on okay – barely. The ride attendants needed to push down the bar. I’m sorry, Universal, but this is America, and a lot of us are, yes, overweight. Why design a widely popular, major attraction with such restrictions? Anyway … the lockers are another major issue, even across the park. They allow you to store your belongings based on what they judge the line to be (sometimes as short as half an hour). This makes it generally impossible to ride multiple times in a row. As hotel guests on Universal property, we could use our hotel keys to go through the Express line as much as we wanted. 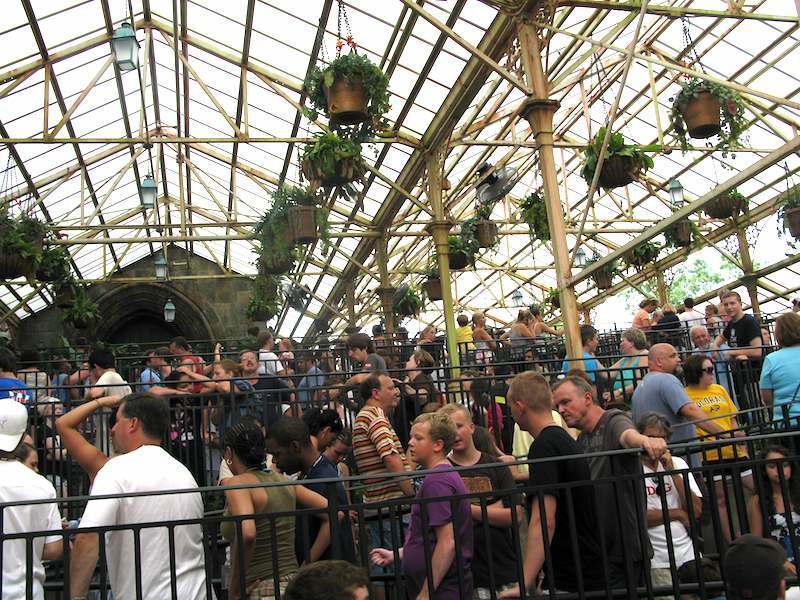 Even on Harry Potter, we rode the single rider line over and over. Unfortunately, to do this, you need to go back to your locker and remove your items only to put them in a new one, sometimes with a wait. If not, you will be charged at least $3.00. Because we were storing our purses in the lockers, this meant having someone carry money or a credit card onto the ride just in case we were late. You also need to memorize a random 3-digit number, which is surprisingly easy to forget after a thrill ride. Overall, it’s just stupid. We spend upwards of $15 just on locker fees getting used to this. Those were my big pet peeves. Yes, the queue and ride were hodge-podge and didn’t necessarily make narrative sense. They seemed to throw in everything potentially scary about Harry Potter (dragons! spiders! Dementors! the Whomping Willow! a rock slide?) when they might have just focused on building up something fun and magical. Great comments and ideas. Thanks. I am of the opinion that HP could have its own stand-alone theme park but it is obvious that investors somewhere have considered this idea and since it hasn’t materialized, apparently it’s not cost-effective. 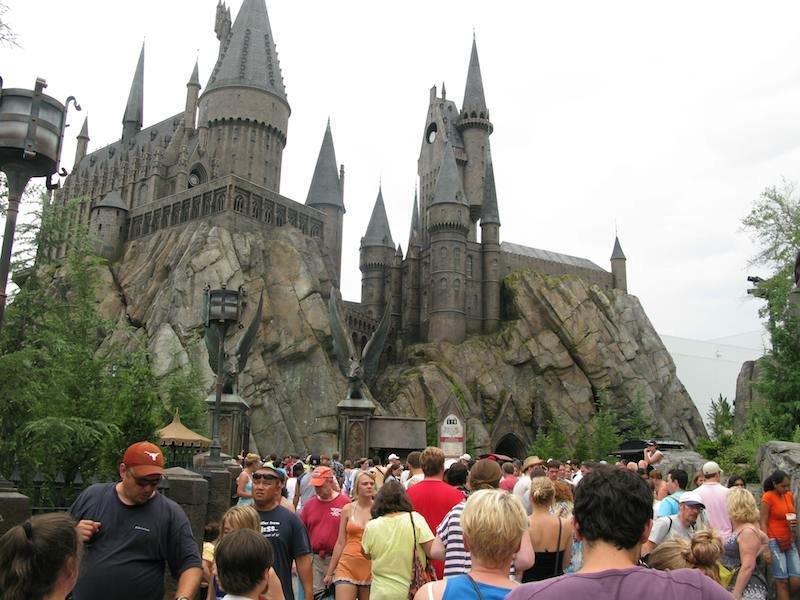 On another note, I am stunned that Universal had so underestimated the success and popularity of a HP park that they would design it so small and with so many flaws. I made my first visit there on what could be considered a “slow” day and it was still too small and overcrowded. I can’t imagine what it is like when the crowds and parks are at full throttle. Miserable I suppose. The atmosphere seemed all about making money and there was an astonishing lack of talent from the staff. WWOHP = disappointing (and overpriced). I think you are right about it’s own park. The one in London at the movie studios (showing the original sets, props, and costumes) sounds fascinating but a separate experience is what I was hoping for. You would go through Diagon Alley first, then board the train, then end up at Hogwarts where you can take classes, experience a Quidditch game (using simpler technology than that awful ride they have). Have a walkthough castle where you can actually see things and experience, like sitting down in a commons room, classroom, great hall, etc. But I fear this will never be. I can guarantee if this ride was built back when the economy was more hopeful in the early 2000s the ride would’ve been the best it could be as a lot of entertainment was better back then. Just like the late 80s and early 90s was another good time for entertainment. A lot of technology except for those who are snobby rich is mostly refurbished or messes up what was done before and you can’t blame any one corporation as they all do it now. Right now big corporations are into giving themselves raises for firing people and going as cheap as possible and this generation has this strange idea that customer input is not valid.